Protein provides your body and muscles with fuel for lean muscle building and post exercise recovery. Proper protein intake is vital for any muscle building or weight loss program. BEST PROTEIN™ is the best combination of quality and overall value on a cost per serving basis. BEST PROTEIN™ is the perfect blend of high quality, 100% whey proteins without any fillers or maltodextrin — a food additive. It’s just 24 grams per scoop of high quality whey protein designed to support strength and lean muscle mass. Not to mention, it tastes amazing! WHY IS BEST PROTEIN BETTER? BEST PROTEIN™ offers more protein on a cost per serving basis. It’s also easily dissolvable, making each shake smooth in texture. BEST PROTEIN™ contains the finest flavoring components so that each gourmet, mouthwatering flavor tastes incredible! With this product, you are getting the most bang for your buck in quality, taste, and price. This blend of isolates, concentrates and hydrolysates combine for fast digestion and easy absorption of protein to support lean muscle mass, fat loss, muscle recovery and muscle rebuilding. 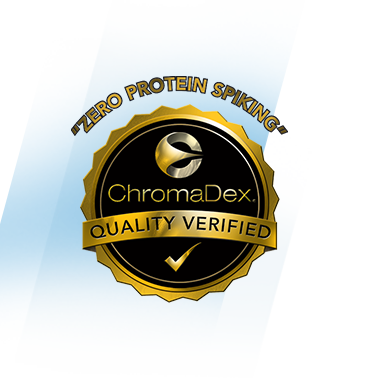 ChromaDex®, a leading 3rd party laboratory and one of the most respected names in the sports nutrition industry, has partnered with BPI Sports to provide its customers with 100% confidence and satisfaction that BPI Sports’ proteins are made of the highest quality ingredients, contain no contaminants and prove all label claims and ingredients are met. 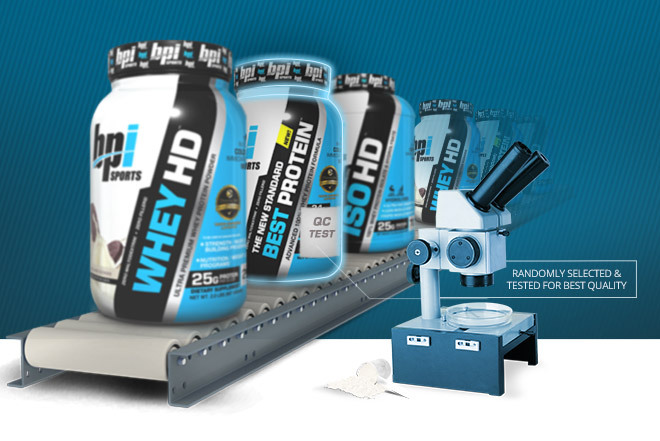 Their stamp of approval on each container of BPI Sports proteins verifies that what is listed on the label is actually in the container and that no amino spiking has occurred during manufacturing. 1. GMP Compliance: More than just a basic checklist. This step audits the actual manufacturing facilities and the manufacturing process used to create the product being tested. 2. QA Support: This additional step reviews the data collected from step #1 and consists of an experienced quality assurance team to support the above, GMP compliance. 3. QC Testing: This vital step for any complete verification program consists of testing for contaminants (heavy metals, residual solvents, microbials) that could alter the quality and content of a product. 4. Regulatory Review: Here, ChromaDex® reviews all product labels for ingredients and claims as well as a safety and toxicology review. This, and every bottle of BEST PROTEIN™ was made from a natural, cold temperature, micro-filtration process, resulting in a finished product that is extremely high in protein, while retaining the important micronutrients. 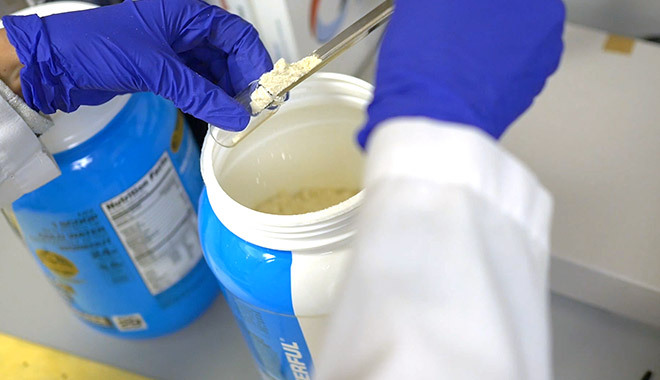 Before our proteins ever leave the factory they are tested in the laboratory for accurate amounts of protein for consistency in quality. The final step is verification from ChromaDex®, just to be absolutely certain that it meets the BPI Standard of Quality. Protein Blend (Milk Protein Isolate, Whey Protein Concentrate, Whey Protein Isolate, Whey Protein Hydrolysate), Natural and Artificial Flavor, Salt, Xanthan Gum, Soy or Sunflower Lecithin, Sucralose, and Lactase. MANUFACTURED IN A FACILITY THAT ALSO PROCESSES PEANUTS, EGG, TREE NUTS, AND WHEAT. Directions For Best Protein: Mix one scoop of BEST PROTEIN™ with 5-6 ounces of cold water and drink immediately after workout or strenuous activity. May also be taken anytime to promote recovery and help build strong muscles. For optimal results, use in conjunction with a proper diet and always consult with a physician prior to beginning a training regimen. Warnings: Please read entire label before use.